Hearing is complex, requiring a series of actions and reactions to work. The process involves many parts of the ear working together to convert sound waves into information the brain understands and interprets as sounds. Sound waves enter the ear canal and travel toward our eardrums. The sound waves cause the eardrum and bones in the middle ear to vibrate. Tiny hair cells inside cochlea (inner ear) convert these vibrations into electric impulses/signals that are picked up by the auditory nerve. At birth, each normal ear has about 12,000 sensory cells, called hair cells, which sit on a membrane that vibrates in response to incoming sound. Each frequency of a complex sound maximally vibrates the membrane at one location. Because of this mechanism, we hear different pitches within the sound. A louder sound increases the amplitude of the vibration, so we hear loudness. Signals sent to the brain from auditory nerve are then interpreted as sounds. Shown here is the undamaged and damaged utricle, an inner ear balance organ, in a chicken. HRP researchers have devised a new method to study the precise timing of hair cell regeneration in chickens using a single surgical application of an ototoxic drug. Photo by Amanda Janesick, Ph.D., Stanford University. When hair cells in the inner ear are damaged by noise, age, trauma, ototoxic drugs, or infections, permanent sensorineural hearing loss results. 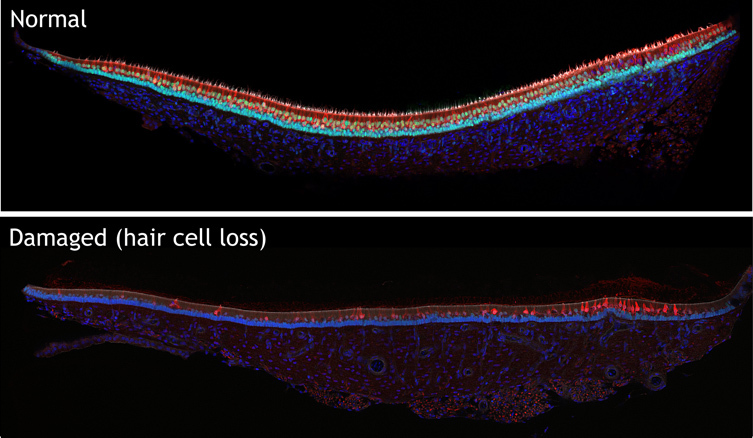 Such hearing loss cannot be reversed in humans—but scientists are hard at work to change this. Hearing Health Foundation (HHF)'s Hearing Restoration Project (HRP), an international scientific consortium, is dedicated to finding a biological cure for hearing loss and tinnitus. Using animal models, the HRP’s 15 senior scientists are studying how birds and fish can restore their hearing in order to replicate this phenomenon in humans. We are grateful to those who support the HRP and our other programs, which fund scientific investigators focused on other conditions such as Tinnitus, Hearing Loss in Children, Central Auditory Processing Disorder, Hyperacusis, Ménière’s disease, and Usher syndrome, and make possible our vital education and awareness programming.